'Leicester South' is a stunningly well presented layout based on the Great Central Railway as operated in the British Railway's era. The infrastructure is faithfully replicated, and this is the Up bracket that Sheffield-bound trains encounter as they leave the fiddle yard. I suspect these are the work of John Marsh - a really nice item. Ralph Roberston wrote: "It is a while since I got your transfers but I have used them very successfully on my LMS ground signals. 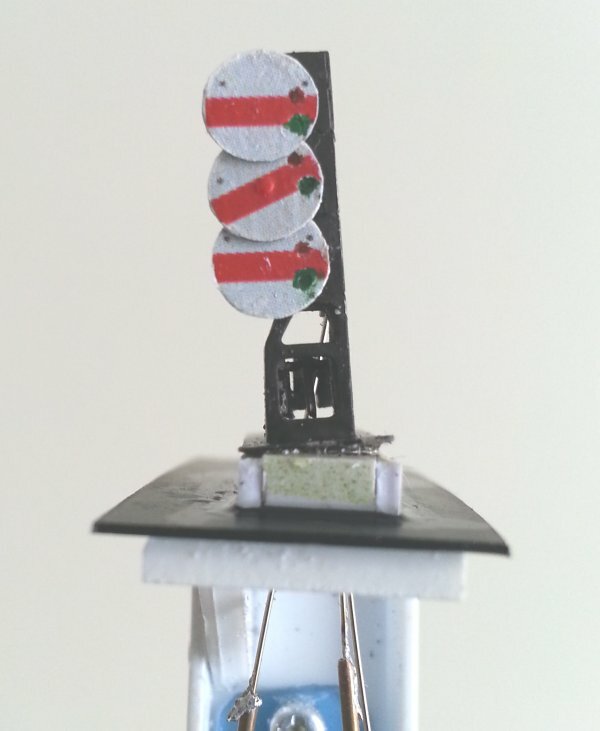 A photo on a 3-high signal is in the Scalefour News and here are some photos I took - amazing how you see all the errors in a photo – need to get the glue out again. They are all driven by servos and work fine despite the small size. The etches are from my own development and can be purchased through my Palatine Models Website. Many thanks for providing a useful sheet of transfers!"